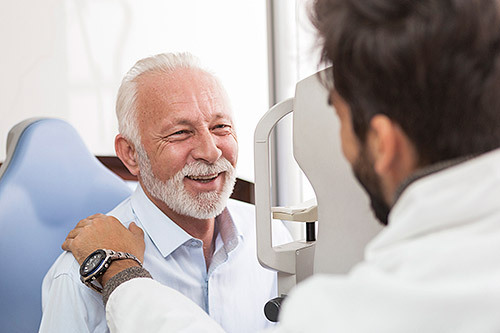 Quantum Vision Centers was the first in the St. Louis area, and one of the first in the country, to offer laser assisted cataract surgery with LenSx®. Traditionally, the surgeon would perform cataract surgery by making a tiny incision in the eye and then using an instrument about the size of a pen tip to remove the cataract. Now, Quantum Vision Centers offers patients the option of choosing to have their procedure using LenSx®, a bladeless, computer-controlled refractive cataract laser that performs several of the most critical steps with an image-guided femtosecond laser – one of the most advanced devices of its kind. The LenSx® laser uses a high-repetition rate femtosecond laser source to make all required incisions; to break apart the old, cloudy lens which is replaced by a new lens. Performing surgery with LenSx® is considered a safe, simple procedure that can literally change your life and ensure that you’ll be able to enjoy the things that matter most – from reading the paper to watching the sunset – for years to come. You can move forward and enjoy your new vision with confidence that you’ve chosen the most advanced technology available.